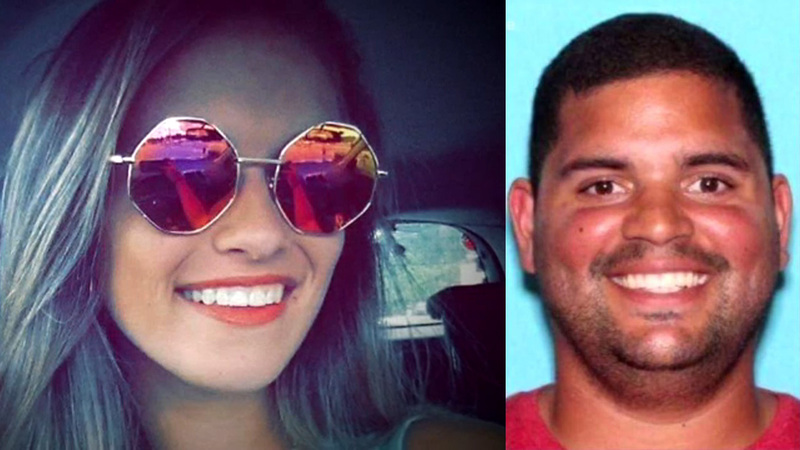 NEW YORK -- The search is intensifying for a missing 17-year-old Florida girl and a 27-year-old soccer coach from her high school who authorities say are together and might be headed northeast, potentially to New York or Canada. Caitlyn Frisina and Rian Rodriguez might be traveling north after the teen left her home on her own, leaving behind her phone, "which she fully erased," the Columbia County Sheriff's office said in a Facebook post on Sunday. Police said they found footprints outside of the teen's home, and she appears to have left through a window. The teen was spotted at a Fayetteville pawn shop with a man believed to be Rodriquez. The teen, 17-year-old Caitlyn Frisina, was spotted in South Caroline with a man believed to be Rian Rodriquez. Frisina's parents told police they had "no indicators" of "any type of relationship between these two," Murray Smith, public information officer for the Columbia County Sheriff's Office, told ABC News this week. From interviews, though, authorities said they have learned of what Smith described as the "blossoming of a potential relationship" between Frisina and Rodriguez. "Caitlyn has a current boyfriend who also is beside himself because everything was fine," Smith said. Her parents are begging her to come back home. "We just want you to know we love you and miss you, we need to know you are safe," mom Scarlet Frisina said. Rodriguez has been working as a boys' soccer coach at Fort White High School, but he has been suspended pending the investigation, according to a statement from Lex Carswell, superintendent of Columbia County Schools. Rodriguez and Frisina had been around each other "at sports events, but they've never been alone at all," Smith said. The sheriff's office said Frisina made a $200 ATM withdrawal Sunday in St. Marys, Georgia, which is about 100 miles northeast of Columbia County. That was the teen's last known location, Smith said. But authorities "believe strongly they're heading northeast," Smith said. He said Frisina has family in New York and Rodriguez has family in Canada and possibly Pennsylvania. Authorities are urging people along the I-95 corridor to keep a lookout, Smith said. They may be traveling north in a 2001 red Mercury Sable with Florida tag Z04CSC, the Florida Department of Law Enforcement said. As of today, this isn't considered a kidnapping case as no criminal charges have been filed, Smith said. But Smith added: "For her to be on the road with this gentleman, I consider that to be a dangerous situation." "We are hoping for a great resolution," Smith said. "We don't want them to think they are in trouble. They've made some poor decisions but who hasn't? Just want them to contact their families and come home." Frisina's parents both wrote messages on social media to their daughter urging her to come home. Her father, Ward Frisina, tweeted Monday night, "I do not care about anything except hearing your voice. There is absolutely nothing that you could have done or be involved in that stops my love for you. You are my only concern. I will come to you no matter the time or place! I love you!" Scarlet Frisina wrote on Facebook Monday afternoon, "I want you to know how very much we love you and miss you! We're not sure why you chose to go, but know that all we care about is knowing whether or not you're safe!! We can work out any issues. We're here with open arms praying for your safety! Please let us know that you're ok. Day or night, no matter what; no judgement [sic], no anger...just know we're here and we love you more than you can imagine!" Caitlyn Frisina is described as having brown hair and brown eyes. She is 5 foot 7 inches tall and weighs 135 pounds, the Florida Department of Law Enforcement said. Rodriguez is described as having black hair and brown eyes. He's 5 foot 10 inches tall and weighs 220 pounds, the agency said. The Columbia County Sheriff's Office has asked anyone with information on her whereabouts to call the authorities at (386) 719-2005. The FBI is assisting the sheriff's office with the case.